Tired of burning your fingers when you take a hot bowl out of the microwave? Here's your chance to remedy those unfortunate events. Come join our very own Louise who will guide you through the construction of a Microwave-Safe Bowl Cozy. Louise's classes are always great fun. Sign up with a friend to double the fun! Instructor Bio: Louise Salgado, is the talent behind most of the quilts (and all the dresses) displayed in the store. 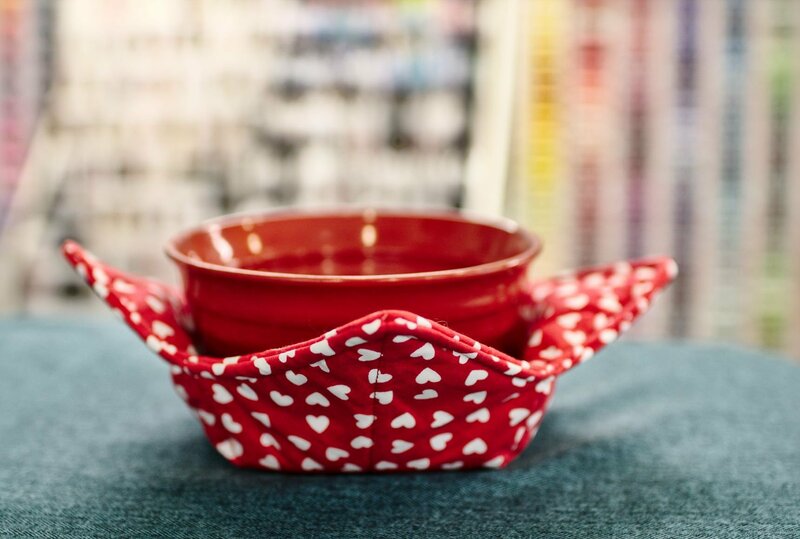 Louise brings experience with all different sorts of sewing projects from quilting to embroidery, including bags, costumes, dresses, and fun sewn projects of all kinds like this microwave-safe bowl holder! Louise guides you along easily and gracefully, offers lots of encouragement when needed, and has great tips and tricks for all sorts of sewing projects.